Sienna's heart actually belongs to her fiancé, Craig, a Navy Seal with the Saint Squad. Craig must fly under the radar if he is to keep Sienna safe from his world of terrorists and toxic bombs. And Reed has no problem pretending to date his old friend Sienna simply because it means he can spend time learning more about Jane. Making a TV series is grueling work but not nearly as difficult as the treacherous adventure that is about to begin with a simple photo taken in the wrong place at the wrong time—an image worth killing for. 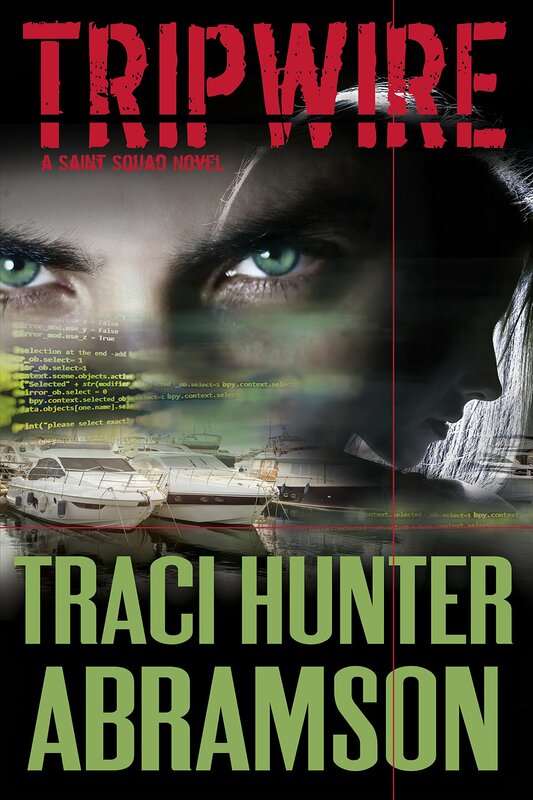 While each of Traci's books are good as stand-alone novels, I really think it would be helpful to read each series from the start, just so you can get to know each of the characters. I have read a few of her books in the past, but not all of the Saint Squad series yet. It got a little confusing at times keeping all of the guys in the squad and their wives straight. That being said, I really enjoyed this story. I'm going to go completely against what I normally feel and say that I do think there was a little too much time spent on the romance and not quite enough on the action part of it. Crazy, I know. I don't normally feel that way, but this story seemed to drag a bit in the middle and I kept wondering what happened to the bad guys and why they weren't showing up very much. When the climax happened near the end of the book though, it really had me on the edge of my seat. I find when I really get into intense scenes in stories, I tense up all of my muscles, like I'm getting ready to run or fight or...I don't really know. It's kind of amusing. At any rate, that definitely happened while I was reading this book. Reed and Jane were great characters, but I found that I liked Craig and his part in the story more. I think one thing I like about the Saint Squad series is that all of them show up in each book, so you feel like you get to know them all even better than before. Another thing I like about this book is that their religion is part of their lives. The author doesn't make a huge deal about it, but it is just there. They go to church, they pray together, things like that. I like that it isn't hidden in the background and only brought out on occasion. I look forward to reading more from this author as well as going back and reading all of the Saint Squad novels. Tripwire is an entertaining story, with a suspenseful beginning and ending, and clean romance in between. I haven't read all of the books in Abramson's Saint Squad series, but enough of them to be familiar with the characters. If you enjoy this series, I think you'll like this latest addition. I was intrigued by the suspenseful situation Jane and Sienna found themselves in at the beginning of Tripwire. As the story moved on, the focus shifted to the budding romance between Reed and Jane. The pace of the story slowed quite a bit during this, and I wondered where the suspense was. Thankfully, the action picked back up at the end. I’ve never loved the name Saint Squad. I like the guys on the squad, and their wives and families, but the name drives me nuts. I do appreciate that the guys on the squad are good human beings though, and that their faith helps them get through their missions. I don't see myself reading this one again, but would say it's worth the read if you have the time. I'm a huge Saint Squad fan, so I was really excited when I saw this book was coming out. Here's my hang-up with series that follow the same people though. I tend to think that once you got your story, the author needs to move on to a different character. Sure, bring them back as secondary characters and create that family feel, but honestly, I was a little disappointed in this story. I wanted more from Reed and Jane, and instead Craig and Sienna got another story. I understand why they needed to be in the story, but I feel like Reed and Jane were a side-note, and I wanted them to be the main attraction. Because they were more of a side-note I felt like their romance wasn't as developed as much as it could have been. He's kissing her before they even go out on one single date. Where's the development? The tension? The...I don't know, anything but insta-romance. Don't get me wrong. I enjoyed the story, and have already read/listened to it twice. It's a great addition to the series. I was just hoping for the story to go places it wasn't taken.